When I purchased my Dell Latitude E6440, almost a year ago, I planned on doing some upgrades to it, post-purchase, no real timetable on when to do the upgrades, just eventually. My first real upgrade was maxing out the RAM to 16GB. My next purchase was to take advantage of this mSATA slot in this computer and move my root and swap partitions to it. The computer came with a 512 GB SSHD. Some people have mixed opinions of the SSHD, I haven’t had any issues with them and do appreciate the increase in speed from the traditional “spinning rust” only drive. I wasn’t sure if there would be any special configurations required in running an SSD verses a regular hard drive and from what I could find as well as talking to some folks on IRC and Telegram, there wasn’t anything I really had to do. I found on Amazon.com a 128GB mSATA SSD by MyDigitalSSD for $50.00 and thought this was a great deal and a great way to dip my toes in using SSDs for the first time. The specifications seemed in line with what I should look for and it was a bit more space than I have ever had for a root partition. I was pretty excited to give this a try. Installing the drive was really very easy. One of the features I appreciate most about Dell Latitude machines is how easy they are to work on, upgrade and repair. They are built well and serviceable but you do pay a bit more for them. The E6440 has a 14″ chassis and has a slot for an mSATA drive as well as the more common 2.5″ SATA drive. There is also a removable optical drive (not common on a laptop of this size anymore) where I can pop in another SATA drive. In order to add the mSATA drive, I removed the bottom panel, which is retained with 3 screws, that easily pops off. There is another cover, in the upper left-side (as looking from the bottom of the machine) that is retained by 2 more screws. Removing that reveals a spot for a WWAN card as well as uncovers the location of the mSATA slot. Insertion of the mSATA card is identical to that of any wifi cards, insert at angle and push down then retained with one screw. There was a bit of work to get the antenna wires in such a position that it would not cause issue with reassembly. Reassembly was just as effortless as disassembly with the exception of taking care to ensure that none of the wiring was shifted or out of the routing channels that they belong. I hopped into the BIOS to see that the storage device was recognized and also re-enabled the UEFI to see how openSUSE Tumbleweed dealt with that. 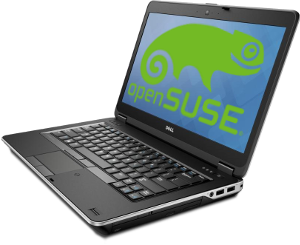 The good news is, openSUSE works with UEFI just as well as the legacy boot system so they have [thankfully] taken the “fun” out of that hurdle as well. Like any openSUSE installation, there was no real effort required. I did take the time to ensure that I partitioned the drive as I wanted: EFI – 250MB, Swap – 18 GB (which I realize I may not even use), and the / (root) partition of what was left which ends up being about 101 GB of usable space. I mounted my existing /home partition appropriately. My “excuse” for leaving a large swap space is based out of a recommendation I have seen about leaving a 10% chunk of an SSD unused to extend the life of an SSD ensuring better “wear leveling” of the cells. I figured, I will not likely use my Swap partition so that is my “unpartitioned” space. I have also read contrary information that states manufacturers take this into account and have extra provisions to ensure more optimal wear leveling and it is a total waste to leave anything unpartitioned. Boot time is MUCH quicker than with the traditional spinning drive. Also, upgrades happen a lot quicker too. I am amazed by how fast each package installs now. I must say, that my weekly sudo zypper dup is a fun day, just watching it happen so quickly makes me grin ear to ear. I tested a few applications, before and after and below are some of my raw numbers, note that I did this with a stop watch on a smart phone so there is some human error involved. Also note, the fact that I am going from an SSHD to an SSD some of those programs might have been cached in the SSD portion of the drive. I loaded the applications after a cold boot to ensure that nothing was cached and didn’t start any of the programs until after the system settled. I now have 56 more GiB of storage available to work with on my SSHD for whatever. Though, I think that will be short lived as I intend on upgrading the SSHD to an SSD of larger size, I’m not in any hurry, so eventually. My Dell Latitude E6440 is much more peppy now that I have this fresh, shiny new mSATA drive tucked in the corner of it’s bowels. After running this machine for several weeks with this new configuration, it only further underscores the benefits of having an SSD for my /home partition as well. Unfortunately, SSDs are still quite pricey but I can certainly see the benefits. I don’t notice any benefit of the EFI secure boot vs Legacy booting or resuming from either suspend to disk or suspend to RAM. I have read that there are efficiency improvements but it may be outside of my ability to notice. Since the E6440 is the last of the 14″ chassis laptops that are so expandable and flexible, I plan to keep this machine going as long as feasible. I am not ready to give up that E-series dock system of which I have a battery slice and E-Legacy Extender. It is the best machine I have ever used and I am probably the biggest, if not only, fan of it. Thank you for sharing! I think you photos look better than mine too. I had toyed around the idea of upgrading my CPU when I felt like I had a need for more processing power. What is battery life like in comparison with this new CPU? I can not give an answer based upon experience to that: The machine nearly always runs on mains. I did select the CPU for its the ‘same-as-before’ TDP: avoiding compatible ones that run hotter. Actually: more to avoid overheating/over-stressing the cooling than for battery life. The two are of course linked. 🙂 One thing I can tell from observation: The fan is very, very quiet. It barely ever runs. Only when I push the machine into ‘high-load’ does it kick in. And then: that load tends to last shorter than before. With ‘ondemand’ throttling those extra cores are quickly put to sleep when not needed. I estimate that the battery life should be longer. When 37 Watt is used at max-frequency all-cores full-load: If you do the same job, the 4-cores are finished sooner than 2-cores, and end up sleeping more. And although the individual core performance is a bit less, the overall performance is much higher and actually in line with a modern 7th or 8th gen system you get today. VERY interesting. Thank you for sharing this information!